Air Force Flag Display Cases make great gifts for retired veterans and men or women who are still in service. Select from a huge range of Air force Flag cases and Air force Flag frames from Flags Connections. Every Air force Flag Frame that you order from this online flag superstore is handcrafted, and made from the best materials on the planet. Do you know someone who has served in the Air Force and is about to retire? Show them how proud you are, and throw a retirement party! Flags Connections has Air force retirements party gifts and Air force retirements gifts that are sure to put a smile on a friend or family members face. Create the perfect display with the Capitol Presentation Flag Case with Display Shadow Box only from Flags Connections. This gorgeous Air force retirements Shadow Box is the perfect place for a 3 x 5 flag. Display your decorated retired Air Force service man or woman’s medals and certificates. The Capitol Presentation Flag Case with Display Shadow Box is ideal for flags flown over the Capitol along with the certificate. The glass front features turn button closures on the back of the flag case compartment, and the display. This gorgeous keepsake is available in Cherry and Oak. Keep the memory alive with Air force Burial flag cases. When an Air Force military veteran retires or passes away, the US Armed Forces presents the family with an American Flag, and if your loved one has just crossed over, it is vital that you protect the memory of your veteran with a burial flag display case. Most people are unaware of the significance of military flag cases, and it is the least that you can do to honor the sacrifices and service that our hero’s have made. Consider buying Air force Flag display cases for decorated veterans, or if you want them to be able to display their certificates, medals and flags consider buying Air force Flag and medal display cases. These, along with a retirement flag and certificate shadow box make an especially nice retirement gift if you want to house medals and flags together. Air force retirement flag and certificate display cases from Flags Connections are proudly made in the USA of the highest quality materials. The Air force Flag display cases can be passed down from generation to generation and is something that you will want to show off in your home or office. Air force flag displays from Flags Connections are anything but ordinary. 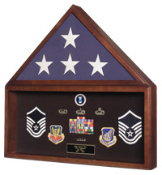 Show off your partner’s medals and certificates in Air force Flag and certificate cases. You can even add photo’s of your loved ones. Show your friend or family member how proud you are with an Awards Display Case. This Military Medal Display Case serves as an Air force Flag Shadow Box that will show off every award, medal, and certificate. The Case is available in different styles and is fashioned out of the finest quality materials. 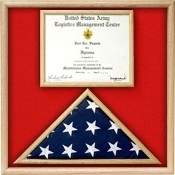 Flags Connections is the only place you need to shop for Air force Flag and certificate cases and Air force retirement flag and certificate shadow boxes. Show your loved one how proud you are with Air force display, medal, certificate and flag cases. Flag cases are one of the finest memorial frames that you can buy to show how proud you are of your family and friends who have served in the military. Most of the military flag shadow box displays that you find on the internet are made of cheap, shoddy construction. The veteran flag cases that you find at Flags Connections are made of solid wood. Unlike other companies, the glass is beveled. The decorative molding, along with the inner beveling gives the military shadow box a classic look that you will not find anywhere else. 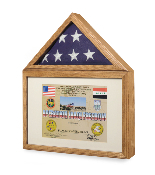 Flag Cases and Flag Shadow Boxes come in a variety of woods including cherry and oak. You can choose a Flag Shadow Box that has matching pedestals, or hang your flag frame on the wall. If you have already purchased a Flag Display Case from Flags Connections, you can buy the stand separately. Buy a Flag Shadow Box, and go with a forward or rear opening. The Flag Display Cases that open from the front have a hinge with a clasp that is magnetic. Military Flag Cases and Flag Frames come in two sizes and can hold a 3 x 5 foot or a 5 x 9 ½-foot flag. If you do not have a flag, you can purchase one from Flag Connections. There is no need to buy custom mad Flag and Certificate Cases because these wood display cases fit all standard sized flags. Each case can be displayed on the wall or on a shelf. Buy Burial Flag Cases from Flags Connections. This 5 x 9 ½-foot display cases are simply stunning. Display your Burial Flag Case on the wall, or put it on a mantel or shelf. The oak or cherry wood casing matches the platform and looks stunning in any living space. 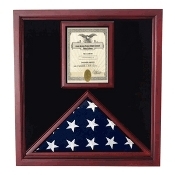 Memorial Flag Cases are also called Military Shadow Boxes and arrive in a triangular. Because of the shape, there is not need for you to unfold the military flag or banner as the Military Shadow Box has been designed for a folded flag.